Agoraphobia is a kind of anxiety disorder in which an individual shows an extreme evasion of situations which can potentially lead to panic. The term 'Agoraphobia' is a combination of two words --- 'Agora' which is a Greek word that refers to a place of assembly or market place; and 'phobia' which means fear. As such, the sufferers of Agoraphobia mostly have a hard time feeling safe in public places where there are large crowds. In other words, people suffering from Agoraphobia anxiety disorder generally fear or avoid certain places and situations which they feel can trigger a panic attack. These places or situations may include use of public transportation, being in a crowded or enclosed place, being outside alone, or standing in a queue. This avoidance of situations and places by the sufferers of Agoraphobia typically results from the feeling of getting trapped or the fear of not being able to get help. Most of the sufferers of Agoraphobia develop this disorder after suffering from one or more panic attacks in a particular situation. As such, they tend to avoid the possibility of another panic attack in the places or situations where it had previously happened; and they often need a friend, relative or any other companion to accompany them when they go to public places. The occurrence of Agoraphobia is more commonly reported in women as compared to men; with teenagers and young adults most affected by this disorder. 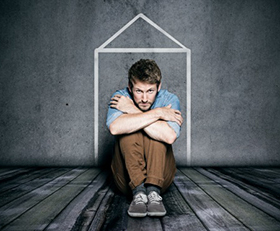 The treatment of Agoraphobia is usually very challenging because it mainly deals with helping the sufferers confront their fears about situations and places which can cause panic. Blood relation affected by Agoraphobia. Agoraphobia is a condition which can restrict the life activities of a person to a great extent, making it difficult for him/her to undertake routine day-to-day activities like visiting friends or relatives, running errands, and going to work or school. Hence, in severe cases of Agoraphobia, the sufferer of the condition may remain homebound for years, completely dependent on others for help. The line of treatment generally prescribed by doctors for treating patients of Agoraphobia chiefly includes the use of medications and psychotherapy, to help the patients deal with the symptoms of the disorder and lead an enjoyable, anxiety-free life. These capsules are prepared from the standardized extract of a very beneficial herb called ‘Brahmi’ (Bacopa monnieri), which has proven medicinal and health benefits, including rejuvenating and cooling properties. Since Brahmi is basically considered a brain and nerve tonic, the capsules prepared from this herb can effectively manage the health conditions related to anxiety, dizziness, stress, and mental fatigue. These capsules can eliminate nervous exhaustion and relax the nervous tissues; thereby inducing a sense of calmness. The dosage of Brahmi capsules recommended for Agoraphobia patients is: 1-2 capsules two times a day, after meals, with plain water. Stress Support capsules are also an excellent herbal product for managing Agoraphobia, as they are helpful in maintaining the overall physical and mental health. These capsules are prepared from natural herb’s extracts– without any filler elements – which can manage disorders that are associated with anxiety and stress; and have proven anti-ageing, anti-inflammatory and healing properties. 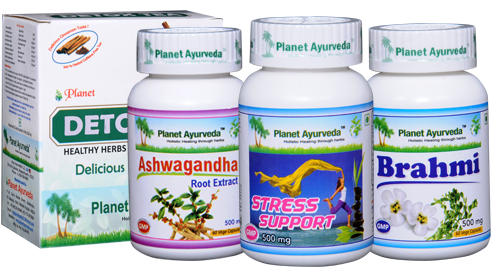 These herbs are: Ashwagandha (Withania somnifera), Brahmi (Bacopa monnieri), and Tagar (Valeriana wallichii). The recommended dosage of Stress Support capsules for Agoraphobia patients is: 1-2 capsules with plain water twice a day, after meals. Another excellent herbal formulation for managing Agoraphobia, the Ashwagandha capsules are prepared from the ‘Ashwagandha’ herbal extract (Withania somnifera). This herb is widely used by Ayurvedic experts because of its anti-oxidative, anti-ageing, immunity boosting, and anti-inflammatory properties; along with its proven effectiveness in maintaining the hormonal balance in the body. Ashwagandha capsules are a wonderful health supplement which can give a notable boost to memory power, thinking ability, awareness, and concentration. For managing the symptoms of Agoraphobia, the recommended dosage of Ashwagandha capsules is: 1-2 capsules twice a day, with plain water, after meals. Detox tea is helpful in balancing the body’s three ‘doshas’ --- Vata, Pitta, and Kapha. It is prepared from several useful herbs which support effective blood circulation in the body, assist in different metabolic processes, and have anti-inflammatory and analgesic properties. 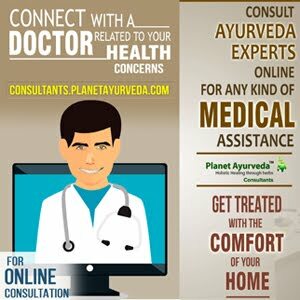 These herbs are: Punarnava (Boerhavia diffusa), Arjuna (Terminalia arjuna), Saunf (Foeniculum vulgare), Bari Elaichi (Ammomum subulatum), Taruni (Rosa centifolia), Dalchini (Cinnamon tamala), Chhoti elaichi (Elettaria cardamom), Bhumi Amla (Phyllanthus niruri). Recommended dosage of Detox tea for Agoraphobia is: 1 capsule, two or three times a day. The use of herbal formulations can be very helpful in keeping Agoraphobia symptoms from getting worse. This is an extremely crucial step in managing the anxiety disorder, especially because mental health conditions can be difficult to treat if not managed in a timely manner.